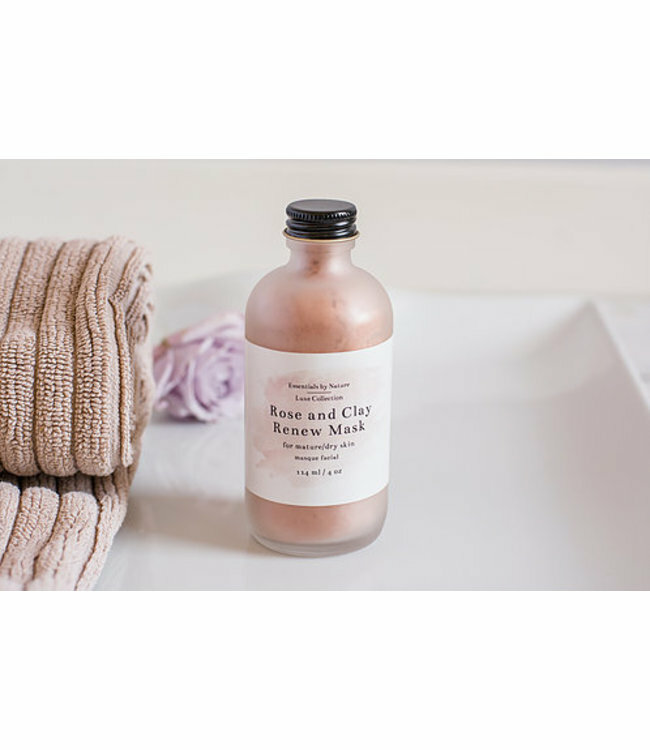 Essentials By Nature Rose Clay Renewal Mask - Refinery Clothing Co. Nature proves bountiful in the all natural formula of this renewing face mask. A nutritive blend of French pink clay, rose hip extract and oils that invigorate the skin to promote cellular renewal, the mask puts life back into dulling or aging skin. Add 2-3 tablespoons of desired liquid until a clay forms. We suggest using water, aloe juice, or our Rosewater Mist or Rosehip and Aloe Serum. Apply onto skin with clean fingertips after cleansing avoiding the eyes and mouth. Leave on for 5-15 minutes and rinse off with warm wash cloth. French Pink Clay, Rosa canina (rosehip) extract, Santalum Spicatum (sandalwood) oil, Citrus reticulata (tangerine) oil, Boswellia serrata (frankincense) oil and Naiba rosaeodora (rosewood) oil. Do not store in the shower. Keep in a cool, dry place. All products are made with natural ingredients and do not last as long as store bought products. We encourage a shelf life of 1 year. Use with caution if pregnant, nursing or under the care of a health care professional.